My rep season with Southern Girl Prep is almost over and I wanted to talk about this amazing tank before my rep code expires. Southern Girl Prep sent me this tank in my rep package at the beginning of summer and oh my goodness!! 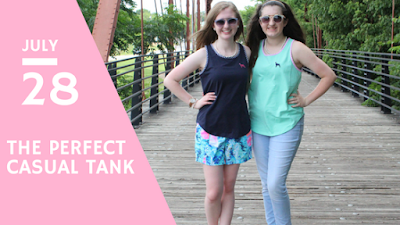 This tank can be styled so many different ways! You can wear it with a pair of jeans, wear it to work out in, or with a pair of shorts which is how I am styling it today. This tank is super soft and comfortable. The one I was sent is navy, has the pink SG Prep logo, and navy gingham trim. I also featured a picture at the bottom of the tank Sarah was sent which is so cute as well! One thing I love about Southern Girl Prep which helps them to stand out from other tee shirt companies I have worked with is that they offer youth sizes as well as adult sizes in almost all of their products! You can use my code PinkEinstein15OFF for 15% off your SouthernGirlPrep.com order. If you read my National Lilly Day post, you've already seen this outfit. I paired my tank with Lilly Pulitzer Callahan shorts in the print Hey Bay Bay and my platinum Jack Rogers. For accessories I wore my pearl necklace, bracelet, and earrings and my Kate Spade watch.